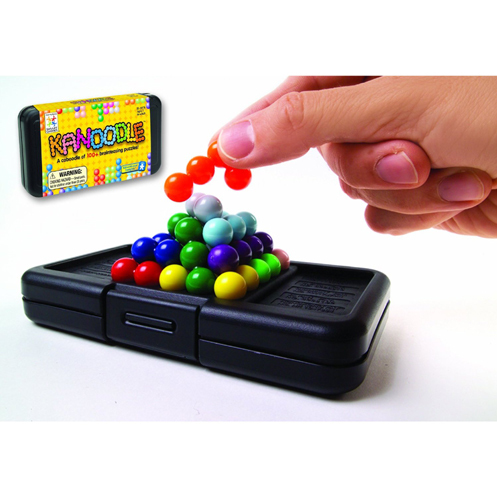 Can you Kanoodle? Use your noodle to solve building puzzles and challenge spatial reasoning skills. Using combinations of colored connected beads, complete colorful puzzles in two unique formats: tricky 2D puzzles and twisted 3D pyramids. To start, pick a design from the puzzle book, place some of the puzzle pieces into position as shown…then fill the empty spaces with the remaining pieces. Sounds simple? Sometimes but...it can also be quite a challenge depending of the level of play. There are hundreds of possible combinations, but only one solution. Puzzle pieces fit inside the handy pocket-sized case with built-in game boards, so you can Kanoodle anywhere. Includes 12 puzzle pieces, 48-page illustrated puzzle book, and carrying case. For 1 player. Measures approximately: 5.50 x 3.00 x 1.00 inches..